The island of Skiathos, which belongs to the municipality of Magnesia, is the western most island in the Sporades, and is litereally just a short boat journey to the eastern side of the majestic Pelion peninsula. Skiathos is an island filled with beautiful green scenery and rich landscapes - the perfect combination of blues and greens. Though the island is small in size, it is a place that attracts huge numbers of visitors each year from around the world. The landscape and scenery blend together perfectly with the cool blue waters of the Aegean and provides the ideal holiday destination for those seeking a place where they can simply unwind and relax, away from the stress and noise of everyday life. You will find some wonderful beaches scattered all around the coast of Skiathos, where you can enjoy swimming and water sports during the summer months. The coastal towns are filled with visitors enjoying the natural delights of the island. 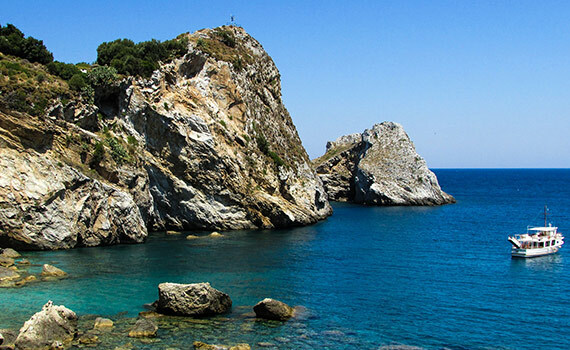 The natural beauty of Skiathos can be found at the two unique and very special lakes that are located here. The first lake is located in Agios Georgios, close to the main town of Chora, while the second can be found at the famous Koukounaries beach. Both of these lakes are extremely important ecosystems for wildlife, birds and fauna. In addition to the beach of Koukounaries, you will find many others such as Kanapitsa, Kastro, Tsougria and Megali Ammos. Some of the beaches in Skiathos are very isolated and many require a boat to get to them. Visitors will also find a variety of activities and places to visit while on the island. The medieval town in the castle on the north of the island is a popular sight, as are the museums you can visit. Stavento Sailing have a number of sailing holidays and daily tours where you can visit the island of Skiathos. If you would like any further information about our sailing holidays that feature Skiathos, please feel free to contact us.